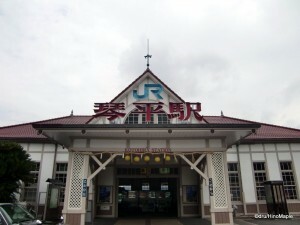 Kotohira is a short day trip from Takamatsu. The town itself is very uneventful with almost nothing to do. The first thing that I recommend doing is going to the tourist information booth in Takamatsu station and getting a timetable for the trains. That way, you know when the trains will leave Kotohira station. There is usually one train per hour. Upon arriving in Kotohira, you will be greeted with nothing. Walking out of the station and up the street will take you to one of the main streets in the town. 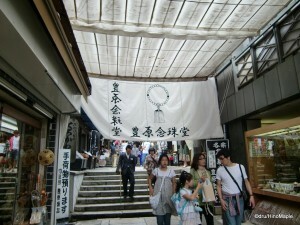 This street is filled with various shops, vendors, and onsens. Several people enjoy an overnight stay in an onsen in Kotohira. I would recommend this as there would be very few people in the area and you might get luck enough to have an onsen almost completely to yourself. 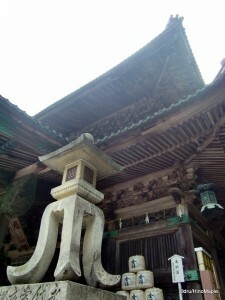 The main purpose of Kotohira is Kompira Shrine. This is a mountain shrine. The base of the mountain is where you will see many aggressive shop staff selling you everything they possibly can. It is very popular to see Buddhist prayer beads, wood carvings, and anything else that can be considered Japanese or religious. It can be a lot to handle as people might be shouting, enticing people to come in. This is also the best place to find the easiest way up the mountain. For roughly 6000 yen, you can pay two men to carry you up to the main shrine. They can also carry you down if you’d like. This is usually for old people, but if you feel like throwing money around and you are too lazy to walk, this is a fun way to get to the main shrine. It also provides an interesting picture to show your friends and family if you are lucky enough to see someone being carried up or down. Once get past this short entrance area, the rest of the hike will start to get more peaceful. As you start climbing the steps, you will have to contend with the greatest problem of the mountain, tour groups. If you are a fast hiker, they will definitely make you slow down, or even stop. They walk line abreast and block the entire path. Making your way through these people is a challenge, but generally they stop along the way and let people go. This can be similar to the rows of tourists climbing Mt. Fuji, but the numbers here are much lower. 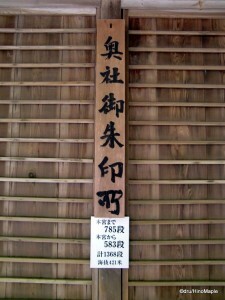 After a few minutes of hiking, you will reach the first sign that you are at a shrine. You will reach a big gate. This is the official entrance and where things will finally get interesting. Past the gate, there is a treasure hall. I have been told that the treasure hall is not special and was to be avoided, so I did avoid it. The next area is a nice rest area. It is at the foot of Asahi Shrine. Unfortunately, you cannot visit Asahi Shrine on the way up, so take a quick picture while you are here. You can get close up pictures on the way down. Asahi Shrine was a nice shrine, but as many people say, once you see a shrine, you’ve seen almost all of them. On the way up to the shrine, you will see a few odd things. I saw a large bronze ship’s propeller. I was wondering what this was for until I reached the main shrine. The main shrine is a nice area. There is a side courtyard with a path up to the inner shrine and spectacular views of the surrounding area. The main courtyard is equally beautiful with many people selling various lucky charms. Off to the side is Ema Hall. It is a very interesting hall dedicated to the safety of seafarers. Many pictures of ships and their crew are placed here for luck and safety. Just past the hall is a very strange set of buildings that is fashioned to look similar to a ship. Words alone can’t explain it, but it was very odd to see for this area. It was extremely modern and didn’t blend at all with the old buildings just a few metres away. However, it is a great place to rest while before you head back down the mountain. If you still have energy, you can go all the way to the top of the shrine. 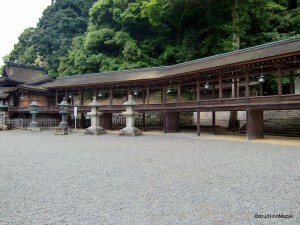 The inner shrine is an extra 583 steps from the main shrine. Reaching the inner shrine is a total of 1368 steps. The challenge itself is worth the trip, and once you venture past the main shrine, you will notice a significant drop in tourists. The walk within the forest is very calming and cool, even on a hot spring afternoon. The views from the inner shrine is not as good as the main shrine, but as I said, it’s a great challenge and it provides a good photo opportunity with a sign telling you how many steps you walked to reach that point. Thankfully, there are many seats at the inner shrine, so you don’t have worry about finding a place to rest. This entry was posted in Shikoku and tagged Buddhist prayer beads, Fuji, hike, hiker, japan, Kagawa, Kagawa-ken, Kompira, Kompira Jinja, Kompira Shrine, Kompirasan, Konpira, Konpira Jinja, Konpirasan, Kotohira, Kotohira station, Mt. Fuji, one horse town, religion, Shikoku, Takamatsu, tourist, こんぴら, 四国, 富士, 富士山, 日本, 琴平, 金刀比, 金刀比羅宮, 香川 by Dru. Bookmark the permalink.